Tough polishing job? Bring in the Metal Doctor! Mothers PowerBall Mini MD® makes costly wheel repairs a thing of the past. MD stands for metal doctor! The PowerBall Mini MD allows you to safely and easily remove tough scratches and stains from your vehicle’s polished aluminum and stainless steel parts with speed and confidence. Mothers PowerBall Mini MD’s special grade of foam is designed specifically for uncoated metals. Used with Mothers PowerMetal Scratch Removing Polish, Mothers PowerBall Mini MD powers through oxidation and removes scratches from wheels, bumpers, grills, trim, and other bare metal surfaces. The round design works well in concave areas and it allows the ball to be used at multiple angles. Mothers PowerMetal Scratch Removing Polish is made to work best with the Mother PowerBall Mini MD. The polishing ball works with your electric drill to provide consistent, fast polishing action. A 10 inch extension gives you easy access between wheel spokes and in tight spaces. The extension is ruggedly built with an integrated sleeve that allows for excellent control and grip as you polish. The PowerBall Mini is reversible, too! When the ball’s performance is affected by wear, unscrew the bit with a 10 mm wrench, free the retaining washer and centering device, and flip the ball. Reassemble the ball and keep polishing! The foam ball is made to be used with an electric drill or air tool. The ball features a drill bit that inserts into the drill. To attach the extension rod to the ball, remove this drill bit and screw on the extension. The extension has its own drill bit. Operate the ball clockwise and start polishing! 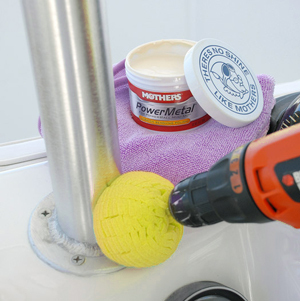 Mothers PowerBall Mini MD will make your vehicle or boat’s metal surfaces shine. The precision polishing tool saves you time and effort. Caution: Mothers PowerBall Mini MD should be used only on uncoated metals.